One of my goals in designing my aquarium was to make things as automated a possible so that I could spend less time working to maintain the tank, and more time enjoying it. I use an Aquacontroller to control the lighting, temperature, cooling, and alarms, but feeding still requires manual intervention. I enjoy feeding my fish whenever I can, and believe that fish benefit greatly from a diet that includes more than just flake food, but there are some good reasons for having an automatic feeder to supplement their diet. Many fish benefit from multiple small feedings throughout the day, rather a single heavy feeding, and an auto feeder can help with this. Also, I travel for work from time to time, and I don't always want to rely on a tank-sitter to keep my fish fed. Plus, I didn't want to have to hand feed every day, and become a slave to the tank. So an automatic feeder was on my list of necessities. But while there are many automatic fish food feeders on the market, almost none of them are easily integrated into a system with an Aquacontroller, so a DIY was required. I chose the Eheim 3581 Automatic Feeder for this project based on its strong reputation and ease of modification. The stock Eheim feeder is programmable to drop food up to four different times a day, and also has a pushbutton which dispenses food when you push it. The DIY modification I'll describe below will take advantage of the manual pushbutton feature and use a signal from the Aquacontroller to trick the Eheim into thinking that the manual feed button has been pushed. The system design is simple. The Aquacontroller will tell one of our DC-8 outlets to turn on when we want to feed. A power supply is plugged in to the DC-8, providing safe 12 volt DC power to a relay circuit. The relay circuit will momentarily close when power is applied, then open and remain open. This ensures that food is only dispensed once even if it takes a minute for the Aquacontroller program to turn the DC-8 outlet back off. The heart of our DIY Eheim controller is a standard 12V automotive relay. When the relay is energized by the DC-8, it closes the internal switch connected to the Eheim. The Eheim thinks the manual feed button was pushed, and dispenses food. Meanwhile a charge is building up in the capacitor until it breaks the circuit, and the relay opens. The Eheim interprets this as you taking your finger off the manual feed button. The resistor slowly bleeds the charge off the capacitor, and in several minutes the relay will be ready to work again. Before that happens though, the Aquacontroller program turns the DC-8 outlet back off. The first task is to attach wires to both sides of the Eheim's manual feed pushbutton. Remove the food hopper, battery cover, and AA batteries. Unscrew the 4 phillips screws on the bottom of the unit and separate the two halves of the feeder. 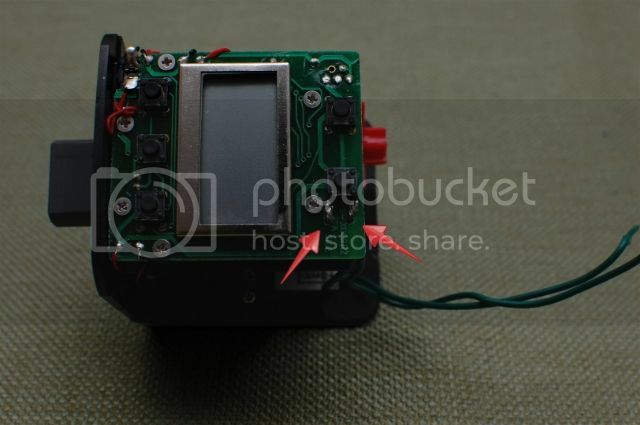 Examine the circuit board where the LCD display and manual feed button are soldered in place. Drill two 1/16" holes in the circuit board near the switch, as shown in the photo below. Run a few inches of light gauge wire through the holes and solder one to each of the contacts of the mounted switch. 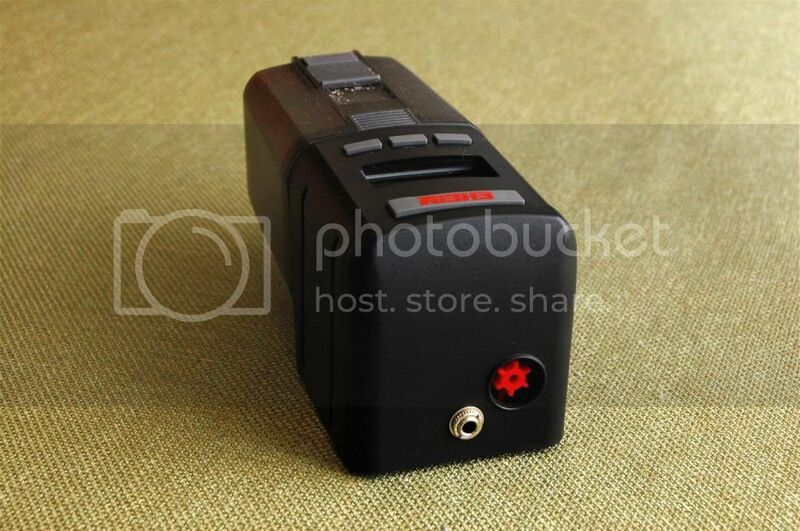 If you were to replace the batteries and connect the bare ends of the two new wires, the electrical circuit will be completed just as if you had pushed the manual feed button, and the unit will rotate to dispense food. Holes drilled in circuit board, and wires soldered to pushbutton terminals. Next, drill a 1/4" hole and install a 2-contact, normally open (NO) audio jack. Solder the ends of the wires to the two jack terminals; it does not matter which wire goes to which terminal. But it is important to position the jack carefully so that it does not block the feeder's fan from moving. Reassemble the feeder and replace the batteries. Assemble the relay, capacitor, and resistor according to the diagram below and secure in a small plastic project box. 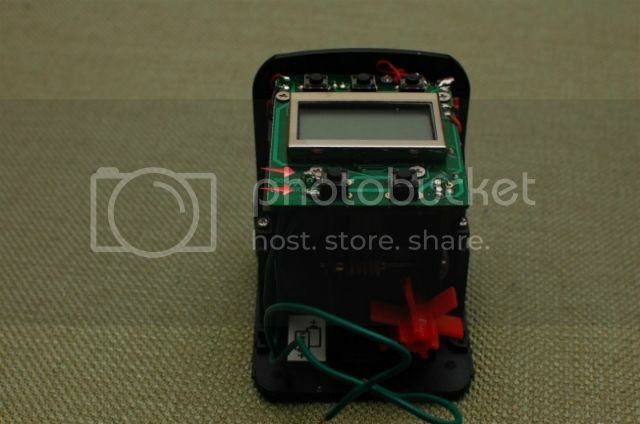 The project box and its contents can be kept close to the 12V power supply, but I recommend using longer wires for the connection between the project box and the Eheim feeder's new audio jack. This keeps the relay further away from the heat and humidity of your aquarium. If you use a polarized capacitor like I did, you have to make sure the negative side is connected to the negative lead from the power supply. Also, check that the switched side of the relay (the side not connected to the 12VDC power supply) is an open circuit when there's no power flowing. If the feeder runs non-stop, you may have connected the relay to be normally closed. I like to turn off my return pump a couple of minutes before feeding to keep the food out of the overflow and give the fish first dibs. Anything they don't get to during the feed cycle is fair game for the refugium and frag tanks, which are further downstream. I use the following program to feed. Don't forget to test your new Eheim before you fill it up with food and stick it on your tank! I've been using the Eheim automatic feeder for years now and have been very happy with the results. The modification detailed above is inexpensive and relatively easy for the DIYer, and I think it provides a significant upgrade in the device's capability. Do ensure the Eheim is attached securely the tank rim or something sturdy to prevent it from falling into your tank. A WAMAS member suffered a tank crash when his auto feeder fell into his aquarium and the batteries rapidly dissolved in the saltwater, releasing whatever heavy metals they contain. It may also be worth noting that if you use X10 modules with your Aquacontroller, an Alarm/Relay module can be used to replace the relay circuit and power supply described in this project. I know the reef aquarist community opinion on X10 is mixed, but I've been using X10 modules with my display tank since 1997 and have found them to be flexible and reliable. Finally, add a note below if you have any questions or comments. Enjoy!